"Ooooh... tanks... Holy Crap! Tanks!" You know, you'd think that having a tank during a zombie outbreak wouldn't be so bad. Well-armored, can travel over all sorts of terrain, and can certainly take out a zombie or two. It's not so good, however, when one's facing you down. 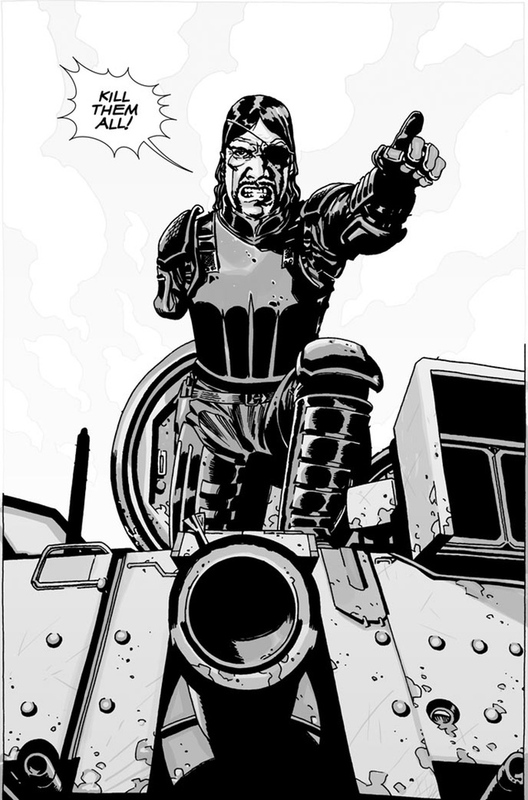 Well, they don't have the actual tanks coming for The Walking Dead: All Out War, but but the Governor in charge of it they do have. This new add-on set includes The Governor, who's not letting his lack of an arm get him down. Nor is he letting the fact that his daughter's a zombie keep him from getting done what he needs to get done. The set also includes a Megaphone and Michonne's Katana (the reason the Governor can't clap normally anymore). The governor is part of the Woodbury expansion add-on set for the game. There's still one week left to get in on all the shambling action.